A large number of alterations for Stagecoach this week, mostly in and around Exeter. Update: some additional info added (in red) Thanks for sending it in! There will be earlier connections between Exminster and Newton Abbot (Mon-Sat) and Ware Barton and Exeter (daily). The following journeys from Exeter will be extended to Teignmouth: 1811 and 2340 (Mon-Sat). The 1810 (Mon-Sat) from Newton Abbot to Dawlish will terminate at Teignmouth with onward connections available. The 1805 5C from Chulmleigh to Exeter will leave at 1815. No details given by Stagecoach yet! The only change to the 27 is the afternoon journey extended to finish at South Devon College. Route Change to Service 46S Tamerton Foliot to Torbridge. The service will operate from September 2016 via Dunnet Road instead of Southway Drive, then Right onto Clittaford Road (Falstaff.) and Left onto Southway Drive, then George Park and Ride, this will provide better coverage for Passengers in Southway. From Mon-Sat we are introducing a number of new journeys on this service. These will replace some of the journeys on our early morning Y service, which is being withdrawn. On Saturdays the 1923 from EDF to the City Centre will no longer run. On Sundays there will be a new timetable operating between Exminster and EDF only and the last bus will leave Exeter at 1810. From Mon-Sat we are introducing a new journey on this service. This will replace one of the journeys on our early morning Y service, which is being withdrawn. The 0628 Mon-Fri from Whipton Barton will also operate on Saturdays. From Mon-Sat we are introducing a number of new journeys on this service. These will replace some of the journeys on our early morning X service, which is being withdrawn. These services are being withdrawn with new journeys being added to services B, J/K/T and R/S. There will be a new journey from South Street at 1900 on Saturday. From Monday to Friday service M2 journeys departing from Paris Street between 0655 and 0910 will serve the Met Office before the Park & Ride site. From Monday to Friday service M2 journeys departing from Honiton Road after 1548 will serve the Met Office on a revised timetable. The 1910 Mon-Fri journey from Honiton Road to the City Centre will no longer run. Thanks as always for your hard work on Devon Transit and Cornwall Transit. Just to clear up some queries. The 13 was a short notice change to add a couple of additional afternoon college day journeys from South Devon College to Brixham. The only change to the 27 is the afternoon journey extended to finish at South Devon College. 971 and 976 carry on as before but were shown by Stagecoach as the 972 to St Peters High School is withdrawn. On Filers 301 it's not true to call it winter timetable introduced as there hasn't really been a summer uplift for the past couple of years. The change involves a couple afternoon journeys towards Ilfracombe and Combe Martin. Thanks! 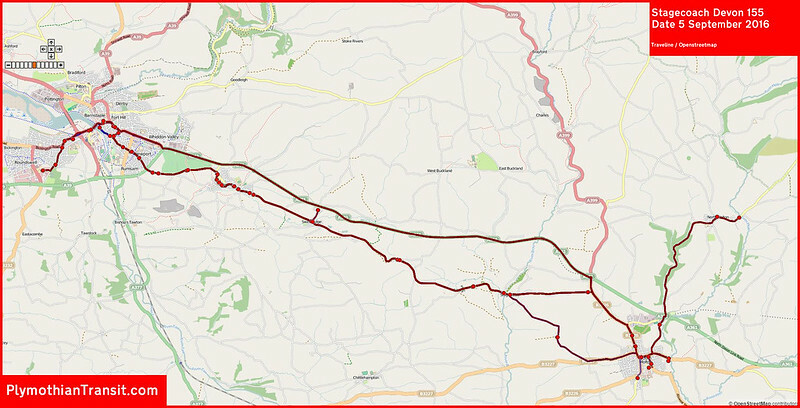 I have added in your details to the main post and will also add the detail to the main route pages later. Its always useful to fill in the missing detail!.